The most anticipated peak to the harvest festival celebration is the crowning of the festival queen, known as Unduk Ngadau in the Kadazandusun language. I will not elaborate on its significance but if you have the time you can find further readings on Unduk Ngadau here. Enjoy some of the many pics captured during the final. Please ask for permission should you like to use any of them in your online or writings and or publications. The seven vying for the seat currently occupied by Miss Crystal Eve Huminodun. The seven unduk ngadau's waiting anxiously for the winners announcement. One UN after another left the group, to be considered unlucky this time around. Here, Miss Sophie Angela Kutam of Ranau in the 4th place proceed to receive her trophy from Her Majesty the wife of Sabah TYT. Then it was down to the three of them. "Constant, cukup-cukup lah bah ko kasi tambah nervous dia orang tu.."
Constantine (teasing Bo Tiza and Jovenea) and Lalita (not in the pic) were the masters of ceremony that day. 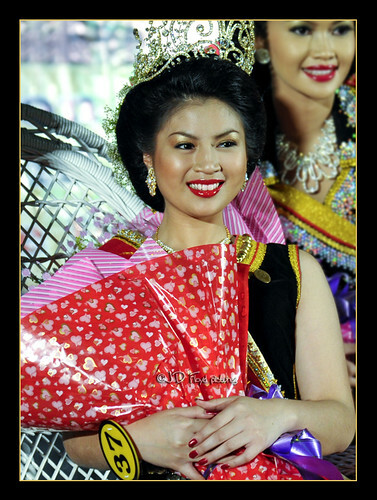 Unduk Ngadau, Miss Bo Tiza Disimon of Penampang is flanked by Miss Jovenea Jim Lajim of Tamparuli (left) and Miss Caroline Anthony of Tuaran (right). 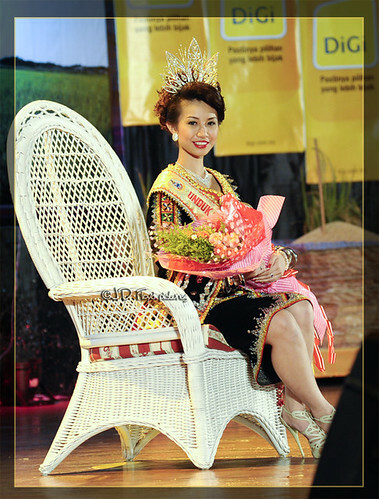 Not forgetting Miss Crystal Eve Huminodun the reigning 2010 Unduk Ngadau. Today is the final day of official duties for her. 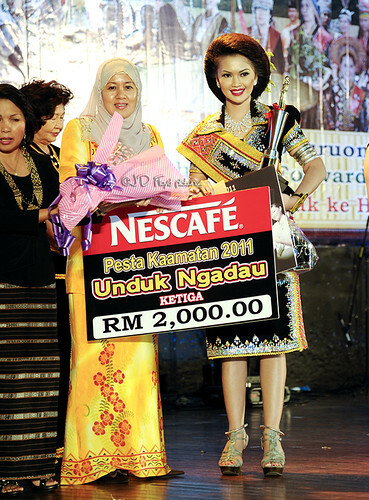 Congratulation to all the winners & Kotobian tadau tagayo do Kaamatan. Note:﻿ I'm not a professional photographer meaning I don't make money out of photography and I know these images aren't as great but they are copyrighted and under no circumstances should they be used or caused to be used without prior and informed consent from me, the rightful owner. I was hoping the UN Ranau get the UN State Level. Anyway, teda nasib lah sumandak Ranau ini tahun! just wondering why the UN consistence their hair all same? ^^!! by da way thanks for sharing bro. t-BA > i think it's the tradition of the UN pageant to set the hair that way. normally held a day before the final round. ***pardon the crap pics, i was using a point-and-shoot compact in low light. alawa ne 2 UN Ranau.. Thanks for dropping by Kirstz. This year, similar festival will kick start on 1st May in a small town of Tambunan in Sabah.